Capture plunging cascades and lupine blooms dotting the landscape in sugar hill, nh. 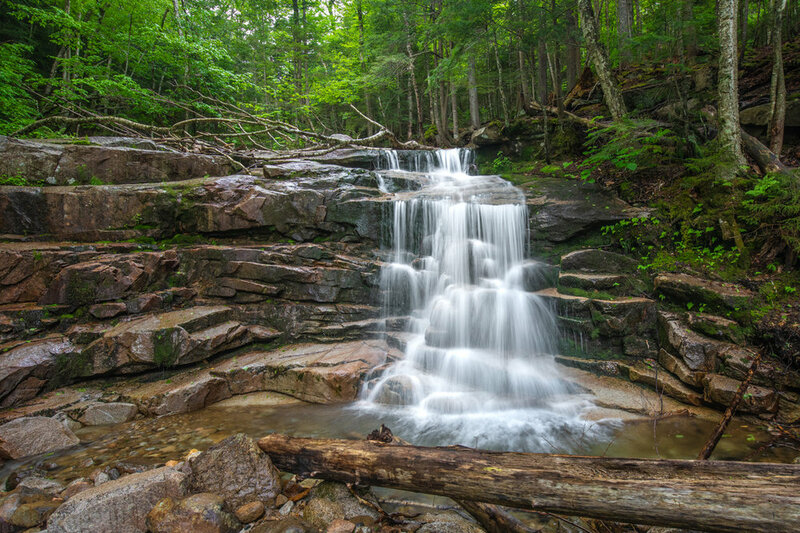 Join David for a full-day workshop in the White Mountains of New Hampshire, where you'll be shooting waterfalls along the Falling Waters Trail. Then, capture the Lupine bloom in the iconic area known as Sugar Hill. We will begin the day by meeting at the Lafayette Campground in Franconia, then begin a hike to the waterfalls. We will see the plunging, 20-ft Stairs Falls, the 60-ft cascades of Swiftwater Falls, and the main attraction, the 80-ft fan-like, Cloudland Falls. We will work on getting to know your camera, composition and especially on how to use polarizing and neutral density filters to create beautiful waterfall landscape images. After a break, we will travel to Sugar Hill to tour many favorite locations for Lupines, which should be at their peak at this time of year. This workshop requires a 3-hour hike on a trail rated as Intermediate/Difficult. We will not be travelling the entirety of this trail, only to the waterfalls, which are located at 0.8, 0.9 and 1.4-mile marks, and requires an elevation gain of 1,000 feet. The trail is approximately 1.5 miles long one-way, or 3 miles round trip. The trail also has a small about of water to cross so waterproof boots and hiking poles are good additions. The workshop starts at 11 AM and the meeting location is the free parking lot for the Lafayette Campground off of Interstate 93 in Franconia, NH. You can use the GPS coordinates of 44.142601, - 71.681395. Parking is available at the Trailhead Parking Lot (when traveling north through Franconia Notch) or at the Lafayette Campground (when traveling south through Franconia Notch). David will be at the bulletin board where the trail starts on the east side of Interstate 93 with his tripod up. If you are a beginner and would like to participate in an introductory primer on photography, please arrive by 10:30 AM. If you are looking for accommodations for this workshop, use the town “Sugar Hill, NH” for a city. This workshop is not overnight, but ends late on the night of June 14.